Wow. This packaging is the most brilliant way to package a hearing aid i’ve ever imagined. Feel free to jump ahead and view the video below of the seemingly simple packaging in action… and then come back to finish reading. Basically for those who can’t hear… how do you help them experience a sound before even getting to the hearing aid within? You show them a soundwave. In action. They have used the plastic sleeve around the box to create the illusion of an animated soundwave as you push the interior box out. Not to mention the simple black and white nature of the design is just classy. My only problem with this design? I can see it being far too fun to just slide the box in and out to watch the soundwave move, and thus it would take too long to get to the actual hearing aid. I love this. 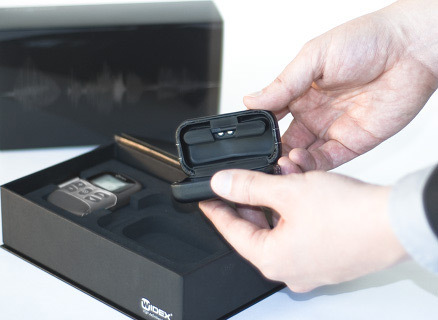 Design is by Copenhagen based design studio Goodmorning, for Widex “high definition hearing”. Very neat. Imagine what this could have done to Peter Saville’s Joy Division cover, Unknown Pleasures. Wow that is pretty amazing. Some of the most innovative packaging I have ever seen!